Your iPhone can alert you to new messages with an audio alert, an on-screen alert, neither, or both. If you want to hear a sound when a message arrives, go to the Home screen and tap Settings→Sounds→Text Tone, and then tap one of the available sounds. You can audition any sound in the list by tapping it. You hear the sounds when you audition them in the Settings app, even if you have the ring/silent switch set to Silent. After you exit the Settings app, however, you won’t hear a sound when a message arrives if the ring/silent switch is set to Silent. If you don’t want to hear an alert when a message arrives, instead of tapping one of the listed sounds, tap the first item in the list: None. You can assign a custom alert sound to anyone in your Contacts list. Instead of tapping Ringtone, tap the item directly below it, Text Tone. And because the same sounds are used for both ringtones and text tones, you can assign the same sound to a contact for both phone calls and messages. 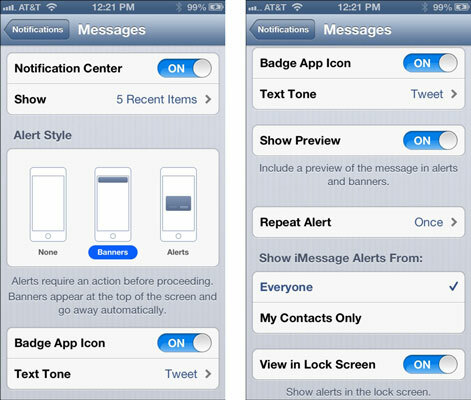 In addition to playing a sound when a new message arrives, your iPhone can also display several types of on-screen alerts. To enable or disable these visual alerts, tap Settings→Notifications→Messages. 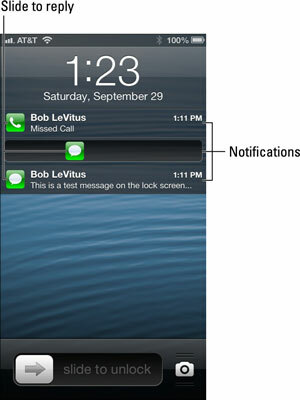 Notification Center: This option is the master on/off switch for Messages notifications in Notification Center. Turn it on if you want to see ’em there; turn it off if you don’t. 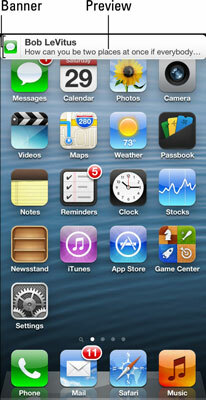 Swipe downward from the top of any screen, except the Lock screen, to see Notification Center. Note, too, that on-screen alerts are not affected by turning this setting on or off. Rather, the Notification Center on/off switch determines whether or not notifications from the Messages app appear in Notification Center. The upshot is that if you choose banners or alerts as the Alert Style, you’ll still see a banner or an alert on the screen when a new message arrives, but you won’t see them in Notification Center. Show: Tap to select the number of notifications displayed in Notification Center. The options are 1, 5, or 10 Recent Items. Alert Style: Tap to select the appearance of on-screen notifications. With the Banners option, a banner appears at the top of the screen and then disappears (with a slick little animation) after a few seconds. The Alerts option requires you to tap a button to proceed. And, of course, the None option means neither a banner nor an alert appears when a new message arrives. Text Tone: Tap to change the sound you hear when a new message arrives (or set it to None). Show Preview: This setting determines whether or not you see the first line of the message in banners or alerts. Repeat Alert: Tap to select the number of times an alert is repeated. Your choices are Never, Once, Twice, 3 Times, 5 Times, 10 Times, or at two-minute intervals. Show iMessage Alerts From: Tap to select either Everyone or My Contacts Only. View in Lock Screen: Enable this option to see new message alerts when your iPhone is locked. Notifications on the Lock screen look like the three that appear here, regardless of whether you’ve selected banners or alerts. They will remain on the Lock screen until you swipe the Slide to Unlock slider at the bottom of the screen or slide one of the notification icons to reply. Note that if only one notification is on the Lock screen, the slider at the bottom of the screen says Slide to Reply; if more than one notification is displayed on the Lock screen, you can swipe the icon of a specific notification to reply to that particular message.